OK friends. Let’s talk Mother’s Day. Before you read what I am going to suggest, I need you to know I love my kids. I cherish time with them. But my favorite tradition doesn’t involve them at all. Don’t hate me. And also know I went through so many versions of Mother’s day before settling on my favorite plan. The cold breakfast in bed surrounded by kids as they “help” you eat the food they made. And really you’re OK with it because you’ve legit never saw a bowl of cereal with that much milk in it and you weren’t super hungry for eggshells anyway. The mad gift buying and then trying to travel around to celebrate all the moms in your world and being plumb exhausted at the end of the day. The getting the kids ready for Sunday Mother’s Day mass only to have this process reinforce your suspicion that you have indeed completely run out of patience. There is beauty in all this I know. As moms, we are so good at finding the joy in the sticky smiles and homemade cards and the blessing over the moms during church. I love those parts with all my soul. But we moms also know that with this beauty comes the sitting in the middle of an argument about who actually made most of the breakfast. We also know we might find a kitchen that needs so much cleaning when we walk downstairs. And the pressure of the day to be perfect would often leave me feeling disappointed and exhausted because of all the expectations. Trying to make it all special while also mothering (or trying to avoid mothering so you can rest…but let’s face it if we are in range of the kids we are mothering no matter how much our husband tries to shield us) can spiral us out of control. As can the waiting for our families to read our minds and make our day perfect for us. So, my friends, I think I have the answer. My family has settled on the best Mother’s Day tradition and if you can pull off a version of this I swear your day might be filled with the joy you imagine it can be. First. 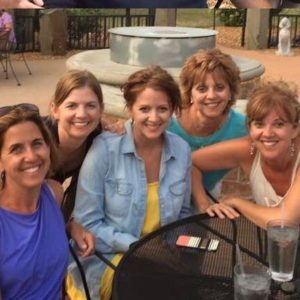 I am super lucky to have found myself living in the same town as 2 of my 3 sisters and my mom. I know, it’s the best. And every Mother’s Day we take the gift pressure off and have just one gift to buy my mother, a book we think she would love. So the gift pressure is totally kept to a minimum, score. Second, my sisters and I ditch our families and take my mom shopping, out to eat and sometimes we even throw in a pedicure. I am out of my house with the moms I love the most doing some of the things we love the most. Total win. Throughout the day we present my mom with her books, she is the star of the show after all, and we also try and be sure and get her an amazing card which she then uses as a bookmark for her Mother’s Day read. The goal, of course, is to make her tear up with the most perfect card. Sibling rivalry without the fighting…another win. By the end of the day, I return home to my own celebration, or maybe a celebration that also includes my awesome mother-in-law if I’m lucky. My family has had time to get their acts together, to make some food, to make sure the house is clean-ish and to get all the sibling angst out of their systems. I am totally filled up and rested after my day away. I am patient. I am able to find the joy. I have a bag filled with TJ Maxx deals to focus on if my kids cannot stop arguing about who sits next to me. This tradition makes my Mother’s Day predictable (read: easy on our fabulous husbands) and fun. Find that thing that will be the same for you. Then nail it down and call it a tradition. As in “Of course I can’t wait to celebrate with you guys but Carol and I always go to a movie on Mother’s Day. It’s a tradition. See you later!”. And my friends, maybe the thing that fills you up is being with your kids all day, hats off to you. Go for it. But if you want to spend your Mother’s Day doing a little something to celebrate you and your favorite moms, a little getaway might be just what the doctor ordered. Carve a little corner of fun for yourself to rejuvenate and reflect on how lucky you are to be a mom in the first place. And a chance to miss my kids always makes me more thankful for them, I’m pretty sure that’s just science. Don’t be afraid to do you on Mother’s Day…it’s your day, you can own it. Or at least a few hours of it. And the sound of your people yelling, “Mom!” when you walk back in the door will be all the sweeter when you return. Here’s to spending time with those we love, celebrating our people and a gift-wrapped nap!